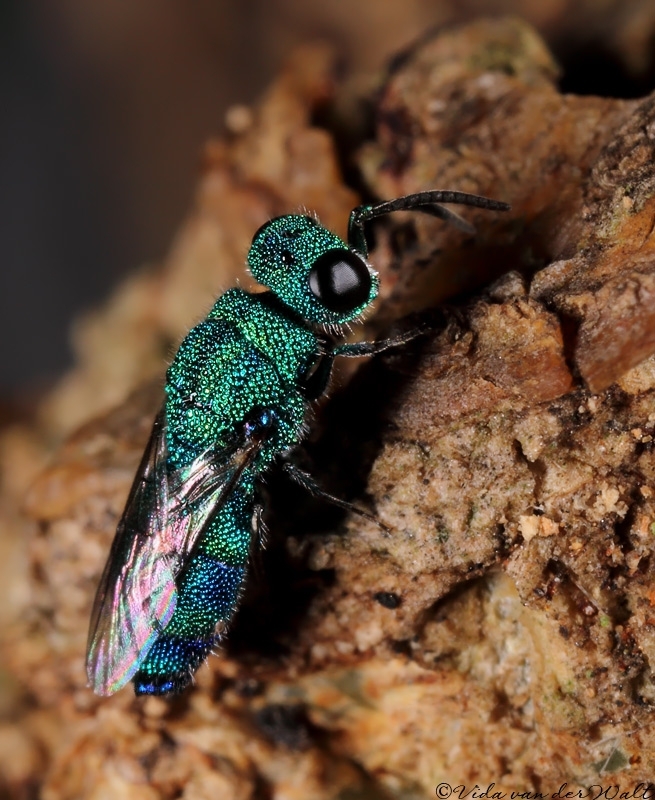 Chrysis Linnaeus 1761. Type species: Sphex ignita Linnaeus 1758 (Designated by Latreille 1810). Parasites of bees (Megachilidae) and wasps: Masarinae and Eumeninae (Vespidae); and Sphecidae sensu lato. Kimsey L.S. 2006. California Cuckoo Wasps of the Family Chrysididae (Hymenoptera). University of California Publications in Entomology 125: 1311. Kimsey LS & Bohart RM 1990. The Chrysidid Wasps of the World. Oxford University Press, Oxford. 652 pp. Linnaeus, C. 1761. Fauna Suecica, i-xlvi + 578 pp. Laurentii Salvii, Stockholm. Mocsáry, A.1889. Földünk fémdarázsainak magánrajza. Monographia chrysidarum orbis terrarum universi. Franklin, Budapest. Ramage, T. & Kimsey, L.S. 2015. The Aculeata of French Polynesia. IV. First record of Chrysis angolensis (Hymenoptera, Chrysididae). Bulletin de la Société entomologique de France 120: 209-211. Photographs © Simon van Noort or Dylan van Noort (Iziko Museums). Banner image © Vida van der Walt.